Hello. My name is Paul. I help innovative social sector leaders leverage data to understand their impact and make a difference in their clients' lives. My clients are busy making huge changes in their communities - I help them leverage analysis and evaluation to become even more effective. Most recently, I served as the Data and Evaluation Manager for the San Francisco Child Abuse Prevention Center (SFCAPC), where I worked with over 60 amazing therapists, educators, and social worker to help our clients build stronger families. In addition to overhauling the organization's data system, I helped executives understand programmatic strengths and opportunities through the lens of program data. My analyses helped our leadership team win funding from the Tipping Point Community Foundation, San Francisco Department of Human Services, and Casey Family Programs, among others. Today, I serve as an independent data & evaluation consultant. I help my clients build a data-informed culture, establish an evaluation strategy, analyze data & benchmark to competitors, and design engaging data products. I'm always looking for ways I can further support other organizations doing impactful work. If you have a project let's talk. Emergency Family Assistance Association, founded in 1918, is the foremost organization supporting families in poverty in Boulder, Colorado. As one of the oldest nonprofits in Boulder, Colorado, Emergency Family Assistance Association (EFAA) has a legacy of supporting those most in need. Along with several other organizations in Boulder County, EFAA committed to increasing its focus on ending inter-generational poverty by becoming a Family Resource Center. But what exactly does this mean? In a collaborative project with ResultsLab, I helped EFAA's programs staff define their approach to supporting families. We elicited feedback from staff & clients, researched comparable organizations, and facilitated multiple conversations to define EFAA's Theory of Change. Once we were aligned on the long-term outcome we hope families will achieve, we identified several specific action items EFAA's staff must take to understand whether their work indeed helps families in poverty become more resilient and self-reliant. Performing Arts Workshop helps young people in San Francisco develop critical thinking, creative expression & essential learning skills through the arts. While Performing Arts Workshop (PAW) had been delivering excellent arts-based empowerment programs to children in San Francisco for over 50 years, navigating outdated data systems for program management and development were taking up far too much of staff's time. Working closely with PAW's Executive Director and senior staff, I implemented a Salesforce database to serve as the system-of-truth for all donor data and support program management. I helped PAW staff articulate their needs, configured and tested solutions in Salesforce, migrated historic records, created user guides and facilitated trainings so all staff understand what they're expected to do. Performing Arts Workshop's staff have continued to use their Salesforce system every week to track major donors, grants, program sites and artist utilization. The San Francisco Child Abuse Prevention Center's mission is to prevent child abuse and reduce its devastating impact. The San Francisco Child Abuse Prevention Center, a social services agency with an annual budget of $6M, was collecting an array of data on its clients – but could this data be used more effectively to inform services and manage performance? Working with staff at all levels of the organization, I created a plan to improve the usability of the agency’s database that simplified data entry and saved staff time. I facilitated discussions with program managers, identified key performance indicators, and created simple dashboards that provide real-time data on how effectively we are executing our program model. I've also facilitated trainings and open office hours to communicate a compelling, authentic vision for our data function and build staff’s skills. Zoo Labs is a nonprofit music accelerator for artists who are seeking to make a sustainable livelihood from their craft. Zoo Labs, an immersive residency experience for creative entrepreneurs, needed a strategy to assess their program’s performance. Working with the founding team, I conducted interviews with staff and board members to identify expected outcomes, bench-marked competitor’s performance indicators, and consolidated expected impacts into a handful of areas. The strategic scorecards we created included key indicators for audience engagement, team strength, and financial sustainability. The Zoo Labs team built these new survey tools and scorecards into their processes for following-up with residents and have used them to gauge program success in regular staff meetings. Net Impact San Francisco is one of the longest standing Bay Area organizations helping professionals create social and environmental change through their careers. Net Impact is an international membership organization of 80,000 business professionals committed to social and environmental change, spread across 300 volunteer-led chapters. 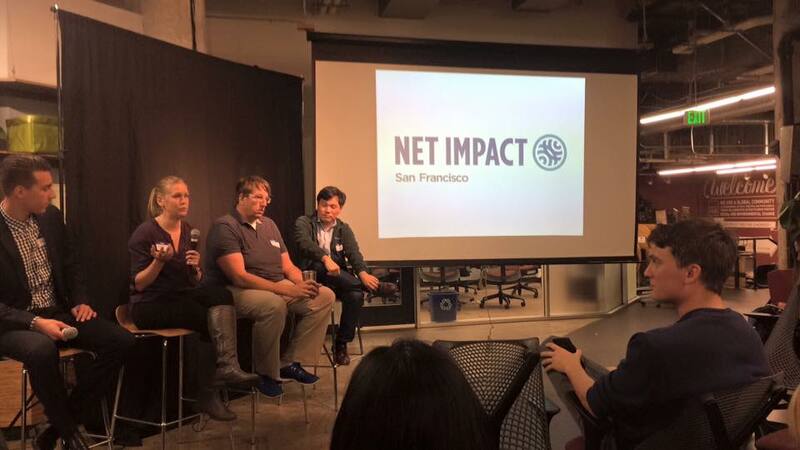 Net Impact San Francisco (NISF) was the organization’s first professional chapter, but with only 3 volunteer leaders remaining, the chapter was on the brink of folding. After taking charge of NISF I grew our volunteer leadership team from 3 to 12. I led this team in hosting 23 sustainability and social impact events in 12 months, engaging over 750 Bay Area professionals. We refreshed the NISF brand through a redesigned web site, new chapter newsletter, and a promotional video. Under my leadership, NISF gained more than 230 new members in 2015 - more than doubling our prior year's growth – and was nominated as one of three finalists for Net Impact’s 2015 Chapter of the Year. Sign up with your email address to receive occasional updates and timely impact measurement resources. Thank you! Watch your inbox (and junk mail) for a re-confirmation email.